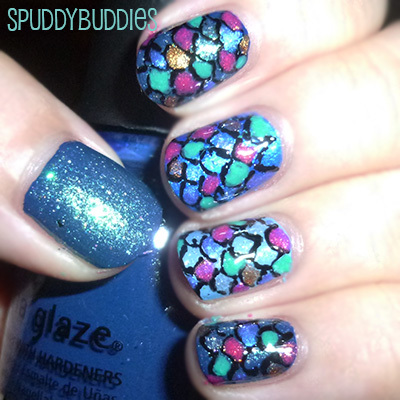 This mermaid tail design has to be one of my favorite nail designs since I started doing my nails. I did this on a whim and ended up loving it so much that I wore it for days! I love mermaids! To me, they're whimsical and beautiful creatures. 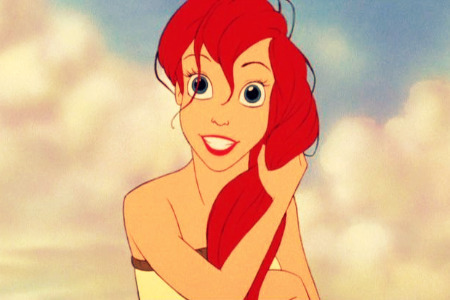 I have always loved Ariel from The Little Mermaid - that amazing red hair and wide-eyed look. Envious of all her red hair though I can't imagine myself looking good with red hair. :S Then there was Splash with Daryl Hannah as Madison the mermaid (I've got to watch that show again!). Mermaids + my love for a good Tom Hanks rom-com = yes, please! After the base colors, I painted one coat of The Face Shop - BL601 (a sheer teal glitter) on all my nails. It's the glitter you can see on my thumbnail. I wanted to give my mermaid tail a hint of glitter and since I only ever used that polish once, I decided that it would be a good time to finally bust it out. 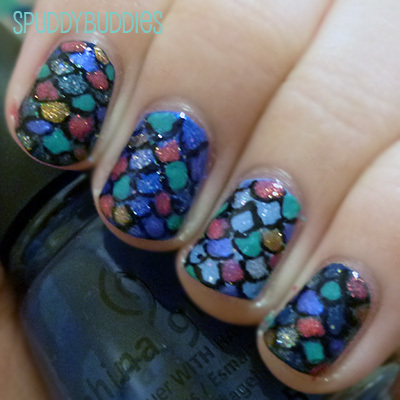 I started with base coat, painted 2 coats of blue polish, used a nail art pen to draw the scales (if you don't have a nail art pen, you can use acrylic paint and a brush or use nail polish and a toothpick/dotting tool) and filled in the scales with color and finished off with top coat. Admittedly it is quite time-consuming to work with a toothpick/dotting tool and black polish to draw the scales but it's what I used to do before I got my hands on any kind of tools. So if I can do it, you can do it too! Just avoid painting your nails too close to bedtime or else you'll have to risk doing only half of what you planned on doing. And this is what my nails looked like on Day 4. Barely any tip wear! I should have wrapped my tips to make it last longer but I'm so bad at wrapping my tips. Any tips on wrapping tips? No pun intended. I asked my sister which blue tail she liked best and she said she liked the China Glaze - Frostbite best. 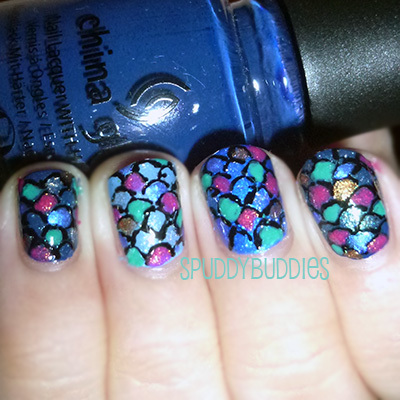 Hmm, at first I liked the China Glaze - First Mate better but now I like them all! What the heck, I love everything Disney (take me to Disneyland, please!!) so one day I might have to do Disney Princess themed nails. Thank you for sharing at Tuesday Trivia. I LOVE pretty nails. It's a must for me to have nail polish on. These are so pretty. Pinning and sharing on facebook. These are great! I really, really wish I had the patience!! Thank you! Doing my nails is about the ONLY thing I have patience for and even then I had to hone my patience. Hi Bailey, thanks for your sweet comment and yay Disney lovers! You are so creative! I would never attempt that! Actually I am so pathetic with my nails that I just go to the salon and get the permanent manicure which lasts for weeks, otherwise I ruin mine right away. These are so pretty. I love having my nails look nice! Thanks Michelle! I really appreciate your comment. 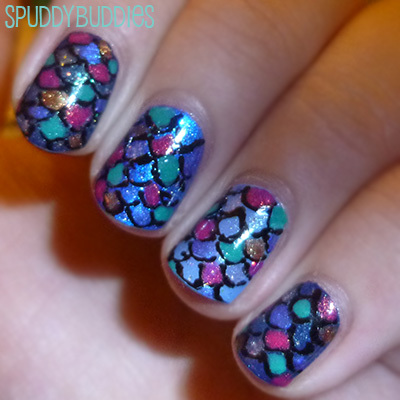 I used to ruin my nails a lot (dents and chips and just ugh!) but then I discovered fast drying top coat - they work miracles! So cute!!! 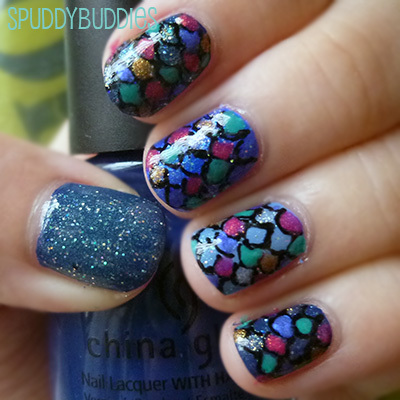 I've been trying new nail designs, and this one is something I really want to try! I'm pinning your nails! Gorgeous! These are beautiful! 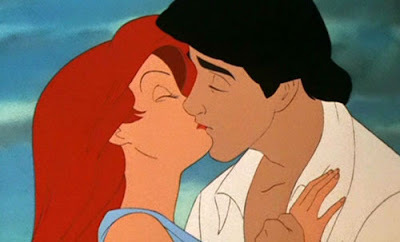 I remember swimming when I was little, and thinking how amazing it would be to be a mermaid. Haha. 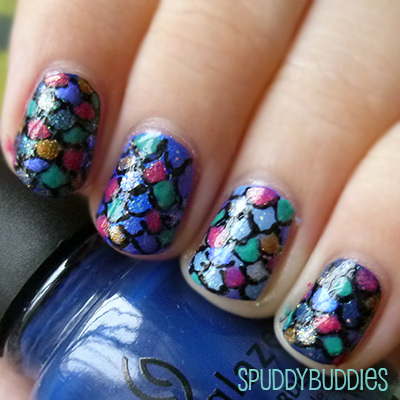 :) I like that the base for your nails is a little different - super cute design! Thanks for hosting such a great link-up, Katherine. I would recommend Sally Hansen's nail strengthener and Burt's Bees cuticle balm - so good for your nails! Really cute and summery! 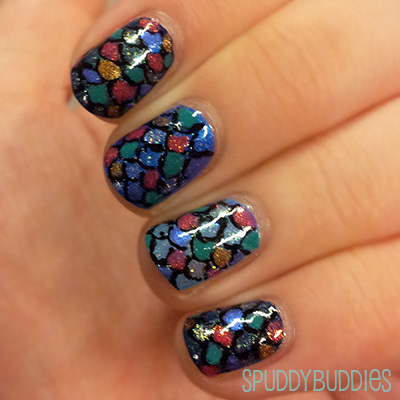 Could you use a black base coat then dot on the colors and add glitter? Also, I keep reading about Seche Vite...why is it the top coat so many use? Thanks, and looking forward to seeing what fall will inspire! Of course! I think it would look magnificently mysterious with a black base :) That's the fun part about nail art, you can use any color combo you want. Haha, before I used Seche Vite I used to wonder what the hype was all about. It's actually a great option if you want a fast drying top coat. It seals in your designs super quick and you can be out the door in thirty seconds! I saw this linked up at Wonderful Wednesday hop and had to take a look. That's awesome!